Courtesy of Kinder Morgan Louisiana Pipeline LLC. Kinder Morgan Louisiana Pipeline LLC (KMLP) has requested US Federal Energy Commission (FERC) authorization to construct and operate system modifications necessary to enable KMLP to offer 600,000 dekatherms per day of firm transportation service utilizing a north-to-south path on KMLP’s system, and for permission and approval to abandon and remove facilities at an existing meter station and the replacement of a larger meter station on the same site. 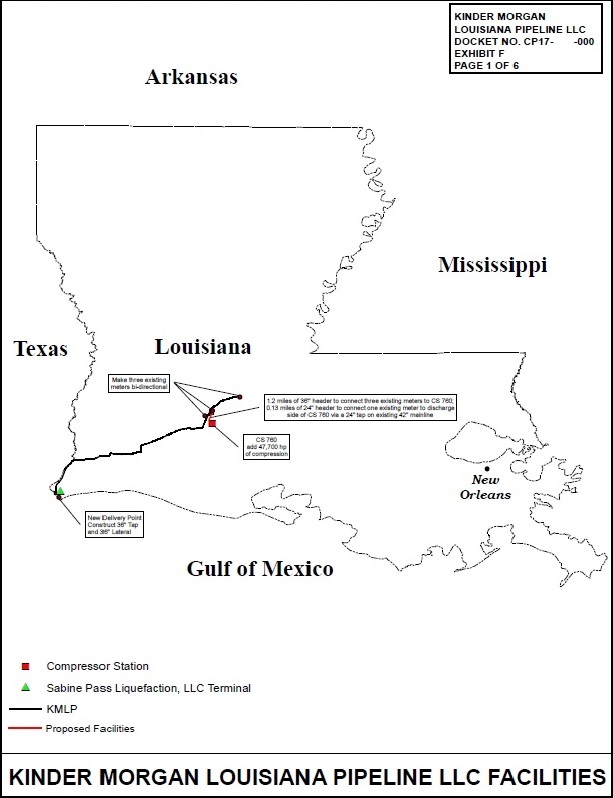 The proposed facilities will provide for gas flow on a north-to-south path on KMLP’s system to deliver natural gas from existing pipeline interconnects to the natural gas liquefaction and LNG export facility constructed (and currently being expanded) and operated by Sabine Pass Liquefaction LLC (SPL) at Sabine Pass in Cameron Parish, Louisiana (SPL Export Terminal). The project will utilize KMLP’s existing mainline and will require certain modifications to KMLP’s system including: 1) construction and operation of delivery point facilities consisting of a tap and lateral to connect to the SPL Export Terminal; 2) modification of three existing delivery interconnects to enable receipts of gas in addition to the delivery of gas; 3) construction and operation of additional compression at a previously certificated compressor station; 4) construction and operation of header pipelines to connect the compressor station to the three existing pipeline interconnects that KMLP proposes to modify; and 5) the abandonment and removal of facilities at an existing meter station and the placement of a larger meter station on the same site. With the proposed modifications in place, KMLP will increase firm north-to-south transportation capacity on its system by at least 600,000 dekatherms per day from the existing pipeline interconnects to the proposed new delivery point with SPL at the SPL Export Terminal. Total cost for the new KMLP proposed facilities is approximately US$151 million. The targeted in-service date for the project is April 1, 2019. The proposed project includes the addition of three 15,900 hp (11,861 kW) Solar Turbine Mars 100 turbine driven compressor units and appurtenances at Compressor Station 760 (CS 760). Authorized in April 2016, CS 760 is an Acadia Parish, Louisiana, “greenfield” compressor station to be constructed as part of the Lake Charles Expansion Project. The proposal also includes installation and operation of certain auxiliary equipment at CS 760 including gas cooling, fuel gas heater, fixed roof storage tanks, filter separators, two compressor buildings (one housing two compressor units and the other housing one compressor unit), an emergency generator, a master control building, an office, a warehouse, an auxiliary building, and a meter building.